Our mission is to provide 100% verified reviews that both consumers and providers can trust to make informed decisions. Consumers demand authentic ratings and reviews to help them find quality providers. Providers want consumer feedback to help them gain insights to improve future patient experiences. The providers who participate in RealPatientRatings are committed to helping you get an “insider” view of their patient care and communication. They’re committed to transparency and actively seek patient feedback. They engage realpatientratings.com to independently survey all of their patients and agree to allow all reviews to be anonymously published on realpatientratings.com. Why do we use a 5-star rating system? A 5-star system is the most commonly used rating classification in the world. We adopted this system because it mirrors what you see in your other online shopping experiences in retail or non-medical services. We want to help you accurately evaluate our members and they want a safe place where they can demonstrate their quality. We offer procedure ratings in the same 5-star metrics that we use for providers. Many medical consumer sites do not include procedure reviews at all. Others don’t use a 5-star rating system. We’re committed to helping consumers make informed decisions about the patient satisfaction with the procedures they’re considering. How can a ratings distribution help you evaluate providers and procedures? A ratings distribution shows the number and percentage of ratings for each category in a 5-star rating system. In all retail ratings systems (Amazon, Google, etc. ), consumers can view the ratings distribution. The distribution here shows you the overall rating for 108,842 verified ratings on realpatientratings.com. You’ll see that the overall satisfaction is 4.72 or 94.36%. It shows a believable variety of scores across the full 5-star scale. You’ll also see that the greatest number is 5’s or Highly Satisfied patients. Note that the ratings include, in descending order, some 4’s Satisfied, 3’s Neither Satisfied nor Dissatisfied, 2’s Dissatisfied and 1’s Highly Dissatisfied. To help you understand the significance of the 77% of 5’s shown here, the next time you shop online, check the number of 5’s or Highly Satisfied consumers. You’ll find that very few highly rated products have this degree of Highly Satisfied consumers. Before choosing a provider, you need to be sure you are seeing enough reviews for statistical validity. If there are too few reviews, you cannot be sure the scores represent a broad enough sample for you to make an informed decision. Therefore, the magic number is 30+ ratings and reviews. You’ll find many providers on this site with hundreds or even thousands of reviews depending on the size of their practice and the length of time they have been our member. How important are recent reviews? Only current ratings and reviews give you the true picture of what is happening now for the practice you are considering. That’s why we survey every two weeks and provide the latest feedback directly onto the practice website, realpatienratings.com and through our selected industry partners. In summary, what you need to be looking for is a spread of 5-star ratings and reviews, a distribution chart with at least 30 ratings in timeframes that enable you to make an informed decision. Recent reviews are imperative and the volume and longevity is another proof point. Why do some providers have star ratings and others do not? 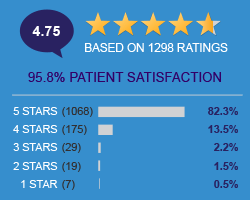 Providers who have a numeric rating with stars next to their name have chosen to publicly display all of their patient comments regardless of rating (example on left). For these providers, the only reviews which do not appear are those which the patient has not given permission to share, or which violate the RealPatientRatings™ community guidelines. When a provider only has a blue "bubble" next to their name, these comments are from patients who have given permission for their comments to be shared online with a rating of 4.0 or higher.